Last weekend I held a grain-free holiday baking class that turned out to be filled with friends. 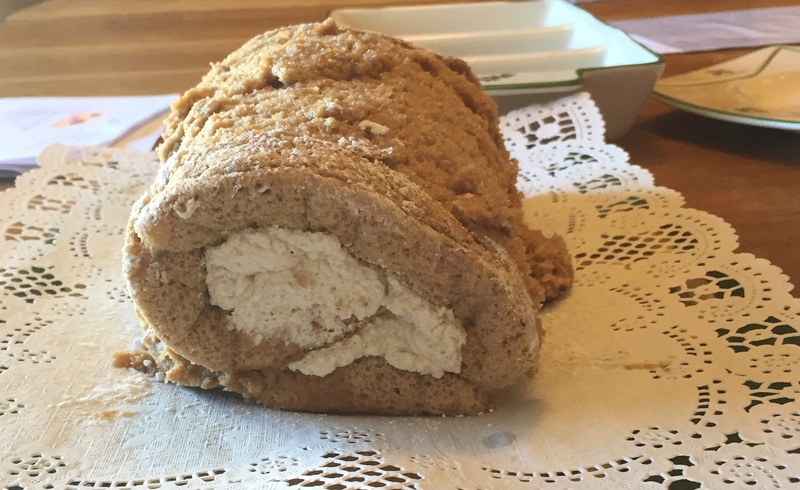 Although not on the menu, I made something for us that intrigued me: a Norwegian flourless rutabaga roulade, or cake roll, Kalrabirullekake Med Kardemommekrem. I’m pretty interested in Norwegian and Swedish culture, as I come from that heritage. One day I hope to visit these lands. I follow a blog called North Wild Kitchen, written by Nevada Berg, an American married to a Norwegian, living and cooking in a stunning part of the country. Two of my friends are Norwegian and of Norwegian heritage, and the Norwegian confirmed that rutabagas are well utilized in the icy winters of Norway. My intrigue mounted when I read “cardamom cream,” and so, early Saturday, I made the cake as a surprise. It was delicious. As you’ll see, North Wild Kitchen’s cake looks PERfect; mine less so, but for a first time, I think it a fine attempt. The flavors are light, the texture delicate due to the potato starch and egg whites. The exotic nature of cardamom, both refreshing and wintery, enhanced every bite. I have the most fun when I’m making something I’ve never made before that has piqued my interest. I may have eaten it only in a restaurant, or it’s a technique I’ve never tried, or a new ingredient. Something gets me going and with excitement I start on the uncharted journey. 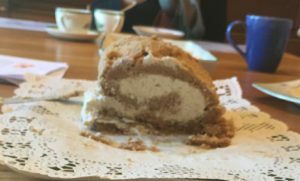 I’ve never made a cake roll. So this post was not planned, but I thought you’d find it interesting, and maybe you’d like to try it yourself. Lykke til! 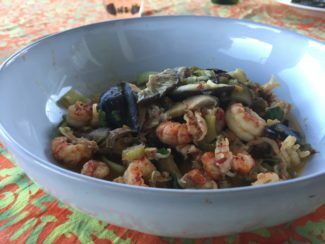 This recipe comes from Nevada Berg, and her beautiful Norwegian-American website, North Wild Kitchen. You make the spongy cake first, then slather cardamom whipped cream on it and roll it! Enjoy! *To make the rutabaga puree: cut off the top and bottom of a large rutabaga; peel with a vegetable peeler. Cut into small pieces and place in a pot of water. Boil until softened (this took 20 minutes or so). Drain. Using a hand blender, or blender (I used a food processor), puree the cooked rutabaga until smooth. Let cool. Use some for this recipe and freeze any remaining puree for another use. Preheat oven to 350°. Grease a Swiss roll pan or cake pan (13 x 9 inches) and top with parchment paper. Leave "handles" of paper laying slightly outside the top of the pan, for lifting out later. Whisk the egg yolks and sugar together in a stand mixer for 5 minutes, until light and fluffy. Sift in the potato starch and mix until well blended Set aside. Combine the egg yolk mixture with the rutabaga puree, coffee, and spices. Add a little of the egg whites and gently fold together. Once blended, fold in the rest of the egg whites. Make the whipped cream: combine heavy cream and cardamom in a stand mixer. Whisk just until stiff peaks form. Set aside. When the cake is ready, remove from the oven and let cool in the pan. When cool, lift out the cake by the parchment paper carefully. Dust the cake with confectioner's sugar, then top with another piece of lightly greased parchment paper. Place a flat baking sheet UNDER the cake and parchment paper; then place another baking sheet on top and flip over quickly. Gently peel off the parchment paper on top. Spread the whipped cream over the cake, out to the edges. Carefully roll the cake, gently peeling the bottom paper off as you roll. Dust the top with more confectioners' sugar. Serve immediately or when desired. It will keep for 2-3 days in the refrigerator.